Every flower girl needs a basket to hold her rose petals! 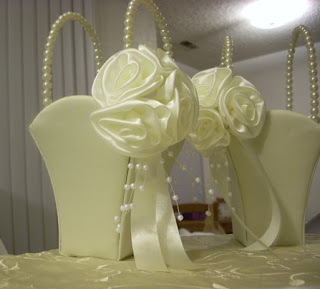 However, bridal shops tend to charge a LOT of money for flower girl baskets. When I had to come up with flower girl baskets for my own wedding I found that the local Michaels arts & crafts store carried a Plain Ivory Flower Basket for a very affordable price (even more so if you have a coupon). Michaels also had these ivory satin flowers and I found the pearl stems in the floral department. All I had to do was twist them in place! 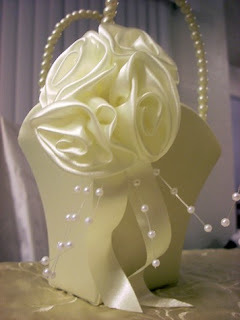 I added a matching ivory satin ribbon to hide the twisty wire as a finishing touch. Two baskets for two flower girls!